Louis and I have always believed that starting our married life in neutral territory is the secret of our 41-year marriage. Living neither in the Philippines nor in Holland meant that we had to rely on ourselves to resolve our every day problems. For me specially, there was no family to run to. Phone calls to my parents took a great chunk off Louis’ salary, so they were limited to birthdays and special occasions. Letters took a week to 10 days and often got lost in transit. All we had was each other. Becoming not only life partners but more importantly, each other’s best friend. The only setback was that our children missed out on having the big family experience. There were no Sunday lunches, no All Saints Day picnic at the memorial park (very Filipino! ), none of those Italian-movie family gatherings under a leafy elm. Growing up away from either of our families, our friends became our children’s surrogate uncles and aunties, their children replaced the cousins who were living in different continents and our household help became part of the core family. Exposure to the real family came in annual 2-week doses. In Manila, they were cuddled (actually crushed with kisses), showered with presents and proudly paraded to all the other relatives, friends, neighbors and anyone else interested – the mestizo (Eurasian) children of Alma and Louis. In Holland, the reception was more sober but nonetheless, warm. Our two children were also never exposed to family rifts and feuds which always seems to be an essential element in a happy family scenario. And neither were we. In my heart though, I often feel that being away from such incidents only served to alienate us even more from the whole family reality scene. Still… that idyllic picture of the long table laden with food and drink under the shadow of an ancient mango tree, surrounded by 2 or 3 generations of happy, noisy family members celebrating nothing in particular except a warm summer day… is the vision that both Louis and I can not shake. Perhaps such a scenario is purely a Hollywood invention. But is it really? Is getting the family together, forgoing childhood resentment and forging new relationships particularly for our next generation too difficult to achieve? Does one really need a Tuscan landscape or a grand ancestral home to make it happen? Clearly the answer is NO. A balcony, a living room cleared of the usual furniture and filled with assorted sizes of folding tables, a rented hall, a public park, any place will do. Because it is not about where, but why. But then again… is it really necessary to instill this ideal of kinship in our children? I remember at 16, running up to my room after an argument with my father, slamming the door and screaming – I don’t need you, I have plenty of friends! And here I am, all of 62 years, unable to remember the reason for that remark , regretting every word, missing my parents, longing to be near my siblings and desperately wanting to create links for my children with their kin. I think that part of Louis’ and my need to bring our children into the family fold comes from the fact that, even here in Holland, they are neither here or there. We do know that they have each other. A couple of weeks ago, Mike, our son flew to London to attend a music festival with his sister. Their 8-year age difference no longer a hindrance. Their separate lives, Mike’s in Amsterdam and Amanda’s in London, serving only to make their weekend reunion even more significant. I am sure they went on a food binge and had a bit too much to drink, but the thought of them together having a good time was reassuring for Louis and I. This is what we had always wanted – our two children growing up, but not apart. And yet, we want more for them. Yes, that idyllic under-the-mango-tree family closeness with their families in both our countries. The reality is : family bonding with or without the mango tree can not be forced. No matter how much time and effort I put into the menu, the décor and the table setting of my perfectly orchestrated Christmas dinner, I am not assured that it will create that closeness among the relatives that I/we have always hoped for. Every family is different. The dynamics within each one, complicated. The relationships even within the core unit, influenced by so many factors – favoritism, jealousy, neglect and so on, or perceptions thereof. The consequence on the lives of the individual members goes beyond the present. It shapes that of future generations as well. But there is no need to rewrite our ancestral history. There is simply an option to start a new one. We have raised our children in the knowledge that family matters. And that there are no perfect families. Just people connected by blood who try to live their lives as best as they can. Undoubtedly, there are, and will always be, differences. But that should only serve to allow for understanding and to make room for forgiving. This is the legacy that Louis and I shall pass on to our children. And hopefully, they - to theirs. 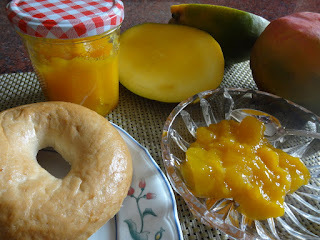 This recipe makes 3 – 4 bottles of jam depending on the size of the mangoes and the size of the jars! I used the Brazilian variety which are readily available in Holland. Ripe Philippine mangoes are a lot sweeter and smaller, so you will need at least 6 mangoes and use a lot less sugar. 1. Before making the jam, make sure you have sterilized jars and lids ready for filling. 2. Wash the jars and lids in hot, soapy water, then rinse well. Place them on a baking sheet and put them in the oven to dry completely. (120/140 C). 3. Peel the mangoes and cut the flesh into small cubes. Place the fruit in a thick bottomed pan, add in the sugar and lemon juice. Mix well. Allow to sit for about an hour for the sugar to melt and blend with the fruit. 4. Cook the mixture over high heat until it boils and then simmer until most of the fruit has softened and reached the thick texture of jam. This may take at least 45 minutes and needs to be stirred constantly. 5. While the jam is cooking, you may adjust the sweetness and/or tanginess according to your taste, adding more sugar and/or lemon. 6. Remove the warm bottles from the oven and place them on a clean dishcloth. They are now ready for filling. 9. Store the jars in a cool, dark cupboard. Unopened, the jam should be good for at least 2 years. Once opened, it has to be kept in the fridge. Other serving options : This jam can also be used to sweeten plain yoghurt, as a topping for ice cream or panna cotta or as pie filling. Or eaten as it. haven't seen you for such a long time. our 2 locations may be walking distance but it is certainly a divide. hopefully, one of these days, we will get to be in the same building again and we can have our talks like we used to. you are definitely a part of my school family. 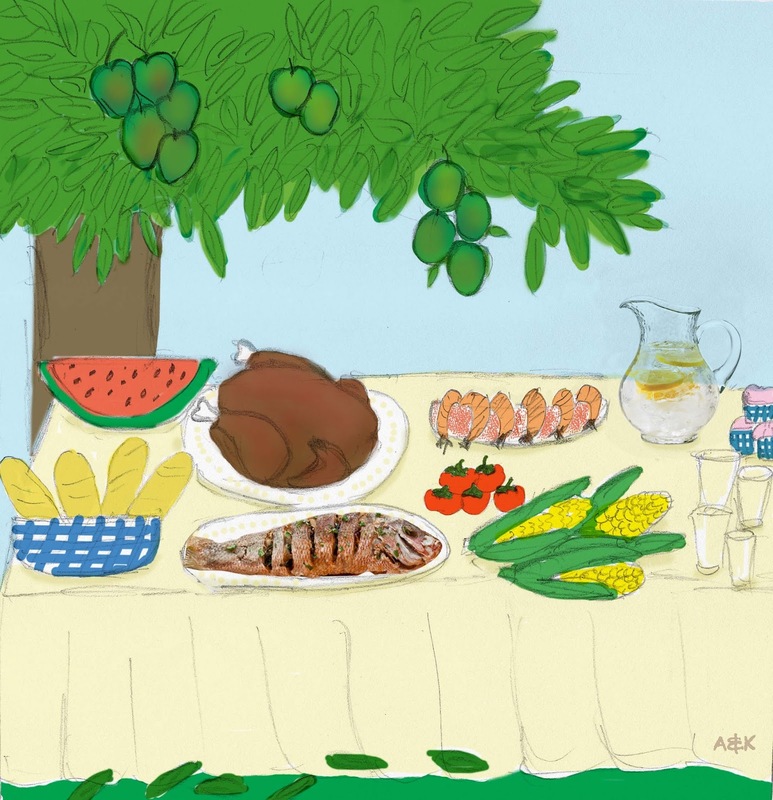 "that idyllic picture of the long table laden with food and drink under the shadow of an ancient mango tree, surrounded by 2 or 3 generations of happy, noisy family members celebrating nothing in particular except a warm summer day…"
I've never experienced that but I have had a couple of mango trees. And now a plam tree, that awaits you and Louis. looking forward to tapas and wine under the palm tree .... soon.